WASHINGTON, DC– Ahead of pending deadlines for initial 2020 premium and rate reviews, members of the Stop The HIT Coalition, including leading organizations representing independent employee advocacy groups, industry trades and business policy organizations called on Congress to urgently suspend the regressive Health Insurance Tax (HIT) before the cost is added to premiums in the next several weeks. Coalition members called for a two-year suspension of the tax from 2020 – 2021 that would provide families nearly $1,000 in savings on premium costs. “With small businesses facing the start of coverage renewals for the upcoming year, it’s critical that Congress prioritize HIT suspension as part of the current tax extenders package or other must-pass legislation. This is the essential window for Congressional action before the tax will be factored into premium rate review beginning in the next several weeks. 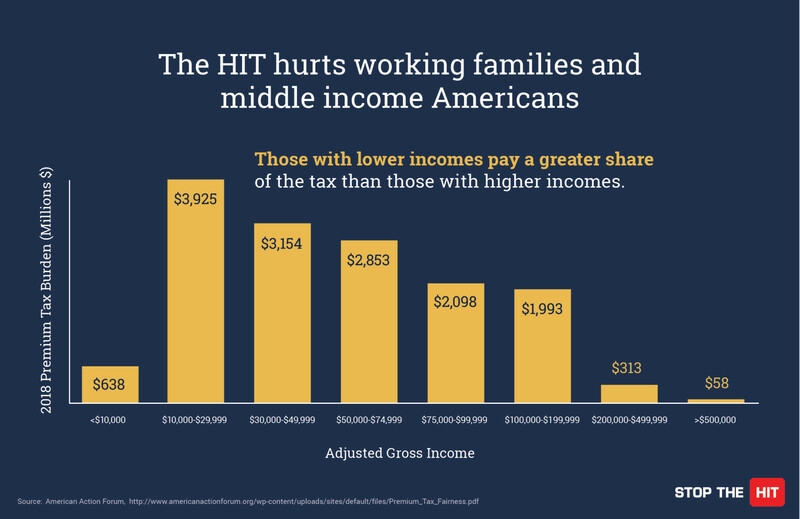 For families bearing the brunt of this tax – those making between $10,000 – $50,000– this cost-savings goes a measurable way in providing relief at the time they need it most. There is broad support for HIT relief across the country and on Capitol Hill. A recent national poll conducted by Morning Consult found that a majority of Republicans, Democrats, and Independents oppose the HIT and the added costs to consumers’ insurance premiums. To view a full copy of the letter click here and to learn more about the impact of the Health Insurance Tax click here.